Perched on a sandstone cliff above the tranquil waters of Lake Delton in Wisconsin Dells, Wisconsin, the Cliffside Resort is a family-owned eastern European seaside resort that offers a relaxing retreat. 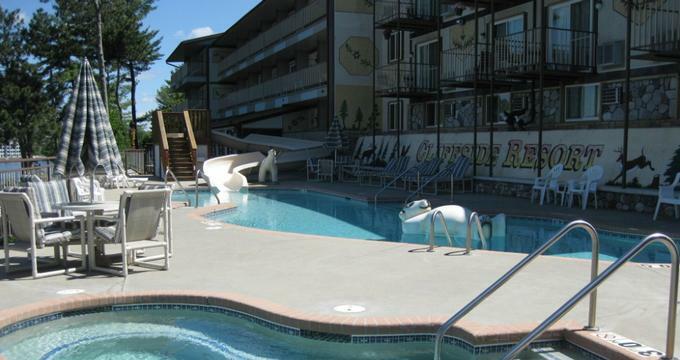 Situated a few miles from downtown Wisconsin Dells and Noah's Ark Water Park, the Cliffside Resort provides comfortable accommodations in the form of guest rooms with en-suite bathrooms, and sitting areas with pull-out sofas, microwaves, mini-fridges and coffeemakers. Upgraded suites have living areas and bathrooms with whirlpool baths, and all rooms have private balconies with beautiful lake views. Upscale amenities at the resort include heated indoor and outdoor swimming pools with waterslides and sun decks, a sauna and a picnic area, a lovely sandy beach and a lakeside pier, and a coin-operated laundry. Guests enjoy complimentary passes to Noah's Ark Water Park. The Cliffside Resort features 42 well-appointed guest rooms and suites with private balconies with spectacular views over the lake. All guest rooms are spacious and bright with king or queen-size pillowtop beds dressed in deluxe linens and soft pillows, and en-suite bathrooms with bath and shower combinations, thick towels and bathrobes, and branded bath products. Modern amenities include flat-screen televisions with cable channels, fridges, microwaves, coffee makers, irons and ironing boards, telephones, hairdryers, and complimentary wireless Internet. Rooms are available in King Lakeview Suites, King Whirlpool Suites (with and without lake views), Lakeview Rooms (with and without lake views), Triple Queen Suites with lake views, and Family Queen Suites. Triple Queen Suites can accommodate up to six guests with three queen-size beds dressed in deluxe linens and soft pillows and en-suite bathrooms with bath and shower combinations, thick towels and bathrobes, and branded bath products. Lakeview Rooms have two queen-size beds dressed in deluxe and soft pillows and en-suite bathrooms with bath and shower combinations, thick towels and bathrobes, and branded bath products, while King Suites have one king-size bed dressed in deluxe linens and soft pillows and en-suite bathrooms with bath and shower combinations, thick towels and bathrobes, and branded bath products. Family Queen Suites have two queen-size beds dressed in deluxe linens and soft pillows and en-suite bathrooms with bath and shower combinations, thick towels and bathrobes, and branded bath products, and adjoining rooms with one queen-size sleeper sofa for additional guests. Amenities and guest services at the Cliffside Resort include heated indoor and outdoor swimming pools overlooking the lake, a 60-foot waterslide and a whirlpool and sauna (next to the indoor pool), lakeside picnic areas with grills and bonfire pits, piers for fishing and docking private boats, as well as a boat launch ramp down the road from the resort. There is a sandy beach which is ideal for swimming and sunbathing, a paved walking and biking path around the circumference of Lake Delton, a games room with a pool table and variety of games, and a gathering room with a fully stocked commercial-style kitchen for special celebrations. The resort also features a fully equipped fitness room, a shared laundry area with washing machines and tumble dryers, meticulously maintained gardens and free parking. Recreational activities include swimming, fishing, kayaking, canoeing, stand-up paddling, wave running, and boating on the lake, walking and biking around the lake on the paved path, ice fishing on the lake in winter, and water fun at the nearby Noah’s Ark Outdoor Waterpark, for which guests get complimentary access passes. Attractions in the area include the Devil's Lake State Park, Noah's Ark Outdoor Waterpark, Duck and Boat Tours of the Wisconsin River, Bigfoot Zipline Tours, Mt. Olympus Water & Theme Park, Timber Falls Mini Golf, Pirate's Cove Mini Golf, Lost Canyon Tours, and the Tommy Bartlett Ski Show. Tours and tastings include the Wollersheim Winery and the Port Huron Brewing Company.